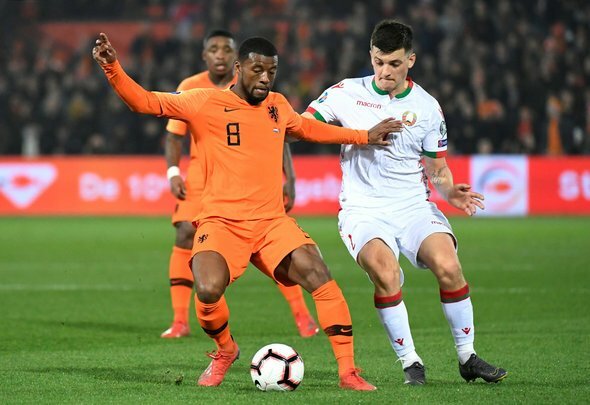 Liverpool midfielder Georginio Wijnaldum scored one goal and won the penalty for another as the Netherlands cruised to a 4-0 victory over European minnows Belarus in their Euro 2020 qualifying match on Thursday. The immediate response from the Liverpool supporters has, rather predictably, been to question why the Dutchman doesn’t score many goals for them, despite clearly having the talent to do so. However, it’s staggering that so many of them can’t seem to get their heads round why this is the case. He plays a completely different role for his country than he does for his club. He is far more advanced for Holland and is asked to do a lot more offensively, whereas at Liverpool, he plays a bit deeper and is required to knit games together from the middle of the park while the Reds’ attacking trio make the difference at the sharp end of the pitch. It doesn’t take a rocket scientist, then, to work out why he scores more for his country than his club. If Jurgen Klopp played him as more of a 10 than a six then he would surely score more goals, it’s as simple as that. Wijnaldum plays like a beast everytime he plays for Holland. When is Gini Wijnaldum gonna bring the goal threat he has for the Netherlands in a Liverpool shirt ???????? As I mentioned last week Wijnaldum scores yet again for holland but can’t for LFC. Someone tell me why?